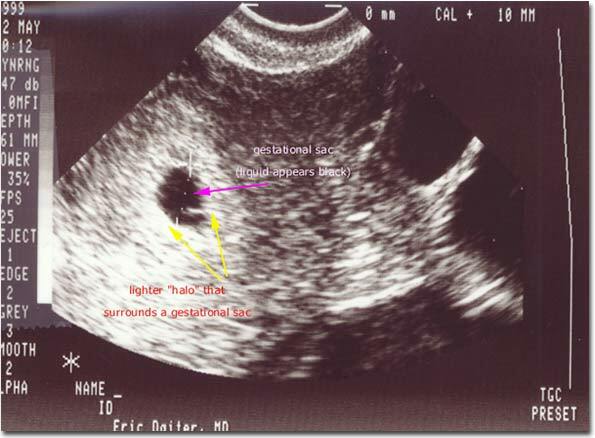 Photograph of a transvaginal ultrasound scan that reveals a single intrauterine gestational sac within the uterine cavity at 5-6 weeks gestational age (3-4 weeks after fertilization). The gestational sac, in which the embryo is growing, is identified as the solid round black structure between the “+” shaped measuring calipers and has an internal small white circular structure (the yolk sac) with an outer light colored halo of tissue (between the black colored fluid within the sac and the darker gray tissue of the uterine wall). High resolution transvaginal ultrasounds can now detect an intrauterine pregnancy (gestational sac) as early as 4 weeks 1-4 days gestation (15 -18 days after fertilization), at which time the gestational sac has a diameter of about 4-5 mm. By the fifth week of gestation the gestational sac has a diameter of roughly 8-13mm.